Quinoa, herbaceous plant of the family of spinach and beet typically cultivated in South America at high altitudes, dresses with our organic chocolate, combining well-being and goodness. 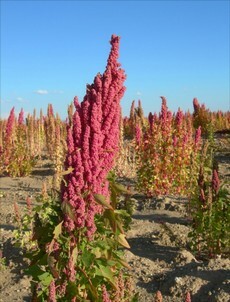 Quinoa is a plant rich in beneficial qualities and energy, therefore already used by the Incas, and plus is completely gluten free. The small and round seeds the plant produces are extremely rich in nutritional properties, for they contain proteins (13%) carbohydrates (60,1%) dietary fats (6,7%) and fibers (8,6%). In addition, for a good functioning of the body, minerals like magnesium, sodium, phosphorus, iron, zinc and some vitamins from B.C.E groups are present. The latter very important as an antioxydant. Aminoacids like lysine and methionine, basic for braincells production and insulin metabolization are also present. Quinoa is our snack which is also organic and Fairtrade and is available in puffed variety which makes tasting more soft and satisfying. The full and rich taste of Quinoa enhances the full- bodied dark chocolate. The effect is crisp, balanced, intense and persistent. Certifications: Organic, Fairtrade, Gluten Free, Vegan Ok.
Quinoa in its crisp carachter breaks the velvet of the milk chocolate maintaining the feeling of purity and freshness. Perception is lively and fresh. Certifications: Organic, Fairtrade, Gluten Free. The dark chocolate without sugar is enriched with the beneficial effects of Quinoa suggesting an energetic feeling. The taste is still crisp and persistent. Thanks to puffed quinoa the milk chocolate without sugar is filled with aroma and texture in his soft shades reminiscent of almond and honey offering an healthy gourmet break.